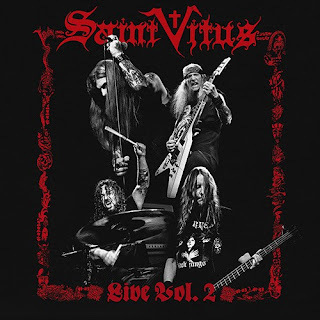 The Sludgelord: ALBUM REVIEW: Saint Vitus - "Live Vol.2"
With several decades of music to choose from, the set list here is a fine thing- not one track is wasted and in my view this does represent a fairly solid “live best” of the band. This is a first rate representation of one of the greatest doom bands of them all. Suffice it to say that for fans of the band this is a must buy. Saint Vitus return to the recorded live format for what is officially the first time since 1990(!). This second official live record features Wino on vocals rather than the current incumbent Scott Reagers. The track list here is no surprise; a good whistle stop tour of the band's catalogue with most eras covered- No “C.O.D” or “Die Healing”, though. At eleven tracks, stretching this to a double LP release is a little much, I think, but most tracks here run to a decent playing time. The sound is pretty damn good, too, with the trio of musicians plus vocals sounding clear and focused. Henry Vasquez is remarkably solid and a fine replacement for the late Armando Acosta. The band kick things off in up-tempo style with “War Is Our Destiny” and “Look Behind You” and thereafter they mix up the timeline with material from “Lilie F-65” and the early albums. “Patra (Petra)” from “V” and “The Troll” from “Mournful Cries” get an airing as does the evergreen cover of “Thirsty and Miserable”. Comparing the track list to their 1990 live outing, it is interesting to see that “Born Too Late” is now a nine minute plus set closer- compared to an early in the set crowd warmer all those years ago. “White Stallions” is a quick and punky classic and “Dying Inside” is one of their best songs. Saint Vitus today are venerable elder statesmen of true doom. There are many, many “doom” bands around these days, but back when Saint Vitus started out there were not, with only perhaps them and Trouble being able to claim the genre. That “doom” has become an over-saturated market place with many bands who are not really doom at all is, frankly, bizarre. Doom as a genre has a straightforward lineage: Sabbath, Vitus/Trouble and then everything else. It has everything to do with riffs, songs and a certain attitude and world view. With several decades of music to choose from, the set list here is a fine thing- not one track is wasted and in my view this does represent a fairly solid “live best” of the band. Wino, for his part, sounds fantastic and really delivers the lyrics with conviction. Is his exit permanent? Time will tell. It would have been very interesting to have a two disc live album with one disc each for him and Reagers, but for now this will do: a fine representation of one of the greatest doom bands of them all. Suffice it to say that for fans of the band this is a must buy.